Have you ever noticed the billboard for the orthodontist, or heard the radio commercials, and stopped to wonder, “Do I need braces?” The truth is, there are many types of malocclusions (misaligned bites) that some people don’t even realize they have – which can all be corrected with orthodontics in Ottawa. Occlusion refers to the alignment of your teeth and the way that your upper and lower teeth fit or bite together. A proper occlusion has the upper front teeth sitting right in front of and slightly overlapping the lower front teeth. A malocclusion occurs when the alignment of the teeth is off due to various reasons. There can be crooked or overlapped teeth, for example, or the jaws may be offset. Orthodontic techniques have been around for hundreds of years to address improper alignment. When you visit us for your consultation, you’ll have an examination of your teeth to help in determining the classification of your malocclusion. There are three different classes of malocclusion you may hear mentioned, along with certain divisions that more specifically outline the unique condition of your teeth. As a patient, there’s no need to worry about knowing or understanding these various categories. They’re simply the method that your orthodontist uses to diagnose, plan, and properly treat your individual situation. Having a wide arch or small and narrow teeth can cause spaces or gaps between them. Gaps can also occur because teeth are missing. Some missing teeth could be ones that never came in – either because you were born without them or they didn’t erupt through the bone for some reason. Missing teeth can also be due to you having a one removed in the past, due to an injury or infection. Unfortunately, losing a tooth may cause other teeth to shift, opening up the space between them. It can be difficult to thoroughly clean all the surfaces of gapped teeth, especially between them where food tends to get stuck. Wide space can be quite embarrassing and even cause speech problems. If you have gaps between your teeth, they can easily be corrected with braces. Crooked teeth are hard to keep clean and challenging to floss. Twisted teeth can cause gum issues as well. The teeth may be misaligned and crowded because the arch is too small and there isn’t enough space for all of your teeth to fit. When you come in for a consultation with our orthodontist, Dr. Charles Cohen will see if you could benefit from arch expansion. 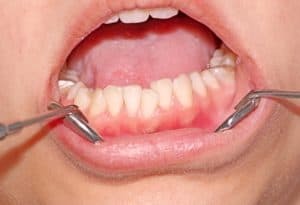 This technique creates more room for your teeth to straighten out, improving your misalignment issue. If you bite your back teeth together and see an open gap between your front upper and lower teeth, then you have an “open” bite. It can be impossible to bite into things with this type of malocclusion. Sometimes the teeth are angled forward and can be noticed even when your mouth is closed, because it causes your lips to stick out. Tongue thrusting, as well as prolonged thumb or pacifier sucking, are common reasons why someone may suffer from an open bite. When describing the perfect occlusion, we said that the front teeth should sit in front of the lower ones and overlap them “slightly”. While this may look an overbite, it only becomes a problem when the overlap is more than just slight. Also known as a deep bite, this condition is seen when the top front teeth overlap the bottom ones – significantly. In some cases, the bite will be so deep that the teeth hit the gums, causing gum issues. Buck teeth are seen when the position and angulation of the front teeth (mainly the two front upper) are protruded, and slanted outward. Having an overjet, or even just one buck tooth, can cause difficulty biting or chewing and speech impediments. Not to mention how unsightly and embarrassing they make people feel. People with overjet are also more prone to dental injuries and emergencies like broken or chipped teeth. An underbite is basically the same as an overbite, but the opposite. Rather than the upper front teeth sitting in front of the lower ones, the lower front teeth sit in front of the upper ones. This is usually caused by a misaligned jaw. In most cases, orthodontics can fix this condition. Occasionally a patient will have to undergo oral surgery to correct the positioning of the jaw. Describing a crossbite brings us again to the perfect occlusion for an example. To check for a crossbite, look at the upper arch – if there are some teeth that sit outside of their opposing tooth, while others throughout the arch sit inside them, then you’re seeing a crossbite. This is another potential reason that braces are necessary. If you need additional potential reasons your teeth need braces, rest assured that investing in braces can address more than just the esthetic appearance of your teeth. Individuals with certain medical conditions may see an improvement in their oral and overall health with orthodontic therapy. Speech impediments, jaw or TMJ pain, difficulty chewing and eating, sleep apnea caused by mouth breathing and snoring, grinding or clenching of the teeth, gum disease and tooth decay can all be minimized or controlled with braces. Ignoring the need for orthodontics can cause your teeth to get even worse. For example, crooked teeth are more prone to collecting food particles which can turn into decay if not properly cleaned. The teeth will also wear down more rapidly, causing functional and esthetic concerns. If you have one of the malocclusions or other conditions listed above, it’s time to consult with an orthodontist. Dr. Charles Cohen and the team at Braces Haven in Ottawa look forward to meeting and caring for you and your family! Contact us today to get started.